The master of clean lines and simplicity Calvin Klein constantly keeps a fresh aesthetic and doesn't fall into the same mundane trap when it comes to creating tights. 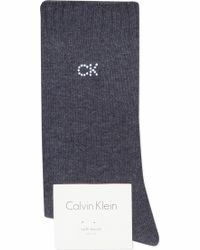 Creating exciting pieces ranging from matte sheer to Microfibre polka-dotted tights to over the knee crochet socks Calvin Klein delivers beautiful and fun pieces season after season. Fashion is supposed to break boundaries and push the envelope, and nobody does it better than Calvin Klein when it comes to tights. Innovation and experimentation has never been this much fun before.